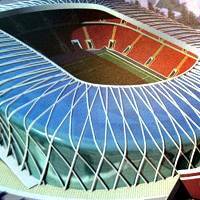 Decision about future shape of Stadion Dinama in Minsk is expected within two weeks. But EuroRadio got the renderings that present potential winning design. Least invasive plan foresees a new roof, while others decided to rebuilt the stadium completely. Just as a reminder, Minsk is preparing for a major overhaul of Belarusian national stadium – Stadion Dinama. In December part of the seats were already dismantled and in January entrepreneurs operating in front of the stadium were removed. What is yet to be known is the final design and extent of changes for the future. Even capacity isn’t clear at this point. But local EuroRadio.fm came into possession of some of the possible concepts. A total of 20 bids had been submitted, from which jury chose the final five in December. This means that at least one of the visible designs didn’t qualify for the final selection, expected within two weeks. Names of the companies behind these works are yet to be determined, but images show a wide variety of ideas. First one plans only a new roof over existing stands, while others see a new stadium (without running track, in most cases) integrated into the existing bowl. Most invasive vision doesn’t even have room for the famous arcades that have been the stadium’s most distinctive feature for decades.